Nicole Kidman stars as a washed up, alcoholic cop in this hard-boiled modern film noir from director Karyn Kusama (The Invitation). It's a familiar story - a grizzled cop seeks revenge against the one that got away, a villain from their past who has haunted them ever since. It's a role that has been inhabited by the likes of Clint Eastwood, John Wayne, Humphrey Bogart, and James Cagney; anti-heroes who operate outside the law to bring about their own brand of justice. Destroyer flips the script, casting a woman as the cop who isn't afraid to get her hands dirty. Erin Bell (Kidman) is a former undercover agent for the LAPD whose parter, Chris (Sebastian Stan), was killed by a bank robber named Silas (Toby Kebbell), with whom the pair were embedded. After a murder with a familiar calling card hints to Erin that Silas has returned, she sets out to find him and kill him by any means necessary, even if that means operating as an outlaw herself. All the while she's struggling to keep her own family together, as her rebellious teenage daughter, Shelby (Jade Pettyjohn) looks for ways to distance herself from her self-destructive mother through a series of cries for help. The film is at once a police procedural and an existential drama exploring the unravelling of a woman who has experienced incredible trauma. Unfortunately it isn't particularly interesting in either facet, relying mainly on Kidman's impressive performance and a third act twist that completely reframes the narrative but doesn't really change much about the character or her methods. Destroyer is certainly handsomely crafted, featuring some bleakly lovely cinematography by Julie Kirkwood and an evocative score by Theodore Shapiro, but the film never escapes the feeling that we've seen all this before in TV shows like True Detective, Hannibal, and even Law & Order. For all its grim, portentous atmosphere, it never achieves the level of self-reflection or genre deconstructionism that it seems to be reaching for. 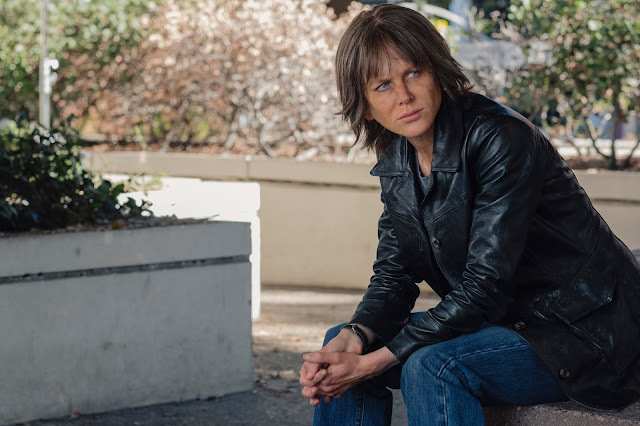 Kidman certainly gives it her all, but the character never really breaks out of the age-old cinematic identifiers of trauma; alcoholism and broken family life. It's a kind of narrative shorthand that often passes for character development, but is more often than not a crutch to mask a lack of depth. In the case of Destroyer, it starts as a clever twist on the classic film noir, but never manages to distinguish itself from the very tropes of the genre it's seeking to subvert. 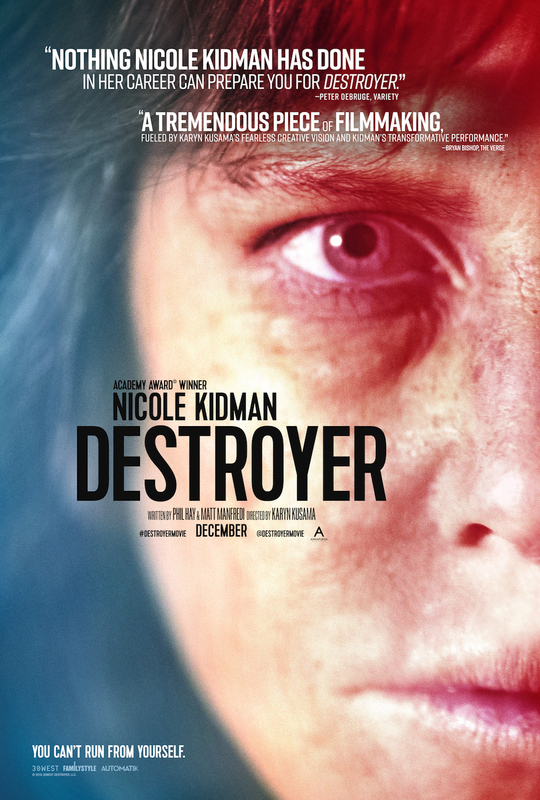 DESTROYER | Directed by Karyn Kusama | Stars Nicole Kidman, Sebastian Stan, Tatiana Maslany, Bradley Whitford, Toby Kebbell, Scoot McNairy, Toby Huss | Rated R for language throughout, violence, some sexual content and brief drug use | Now playing in select cities.